During my childhood, I often went to Boston on the train from my hometown, Winchester, Massachusetts to go to the Science Museum or to go shopping. 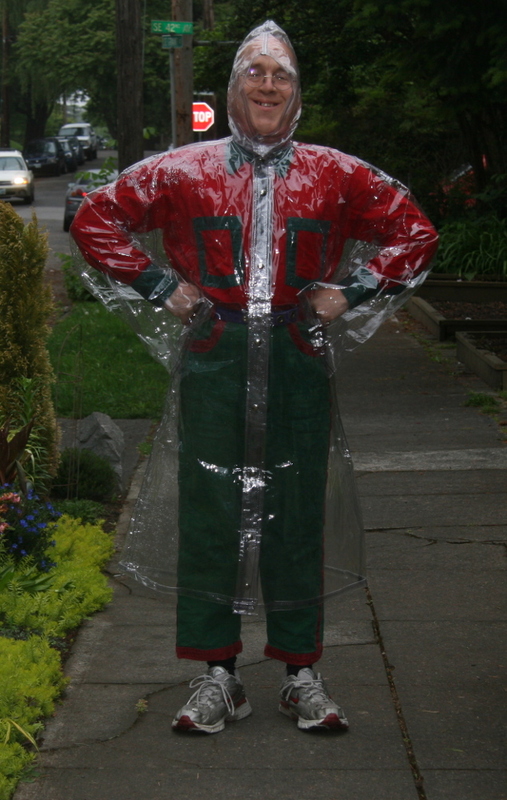 On one of those excursion, I saw a woman wear a transparent raincoat with a very large transparent hood. I asked her where she got it. She told me she got it at a store that had gone out of business. I did not let that stop me. My hope and determination and willing to learn has resulted in myself creating this garment which is one of my favorites! And thanks to these fine folks at Bed Bath and Beyond for their vast collection of clear plastic shower curtains which I use to make many of my raincoats! If you were the woman I met at North Station in Boston sometime in the early 1970's, please email me at allyn (at) well.com. Let me thank you for your inspiration! Or, if you were the man I saw going into the Stuart Theater in downtown Boston who also wore one of those raincoats, please email me as well!